We’ve started producing biochar at the farm, primarily for our own use, but if you twist my arm hard enough I’ll sell some as well. Low tech, low cost biochar pits can produce good char even from less than ideal wood sources if tended properly. I wanted an easy place to refer back to when I forget the recommended ratio to mix with compost for a good biological/mineral/nutrient pre-charge and subsequent application rates. So here it is! Apply pre-charged biochar directly to root zone or in seed furrows at a rate of 1 to 10% biochar by volume of amendments applied. Let the char cool/drain overnight and dig out into your compost piles. 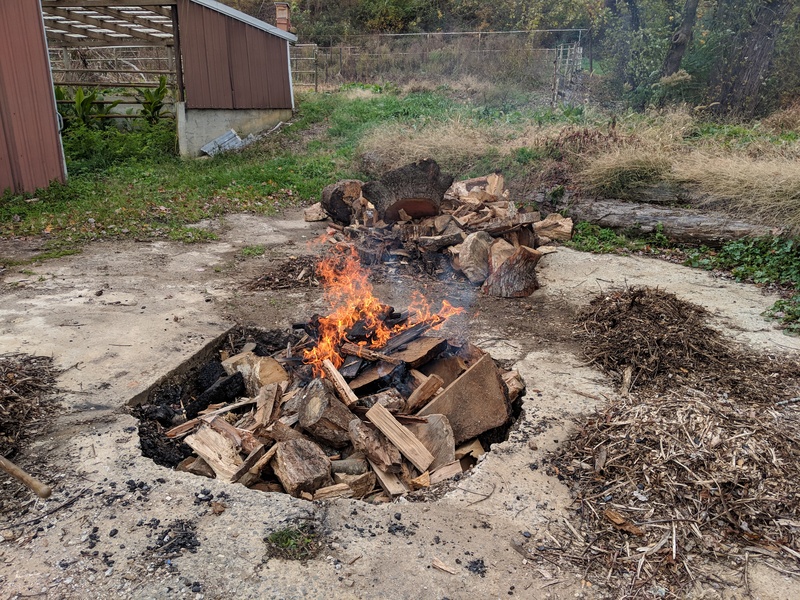 For our biochar pit (6′ diameter, 4′ deep) it takes about 8 hours to char 6 cubic yards of bulky less than ideal wood. A well tended burn will yield around 250 gallons of char.